Whether you plan on building a new horse barn in Georgia, or you’re going to add to an existing one, horse stalls are a great investment so that your furry four-legged friends have their own space to sleep at night. As you dream about the type of stalls you want, Wholesale Direct Carports wants to share some tips on how you can make the most out of your new horse stalls. Most make the mistake of building their stalls too small, creating an aisle way too narrow, and forget to think about the future of their metal horse barn use. This is why we want to help you decipher what makes a great horse stall installation. Before you gallop into building or installing horse stalls, you need to consider whether you will be adding them yourself or hiring a contractor to do it for you. While the team here at Wholesale Direct Carports admire the DIY spirit, we also encourage our customers to hire a professional. Not only do you get a finely crafted end-product, but you also relieve all the stress of potentially building the stalls incorrectly. Will I need more space for more horses? Will I use my barn for needs outside equestrian? Do I have enough space to use my barn for other needs? How long will I own this barn? A common issue that current barn and stall owners realize is that they didn’t build their aisle ways wide enough. It’s tough to turn a horse around or guide two horses past one another in a narrow hallway. A wider aisle way allows for more freedom of movement and usage of the barn for other needs. Following closely behind the narrow aisles, horse owners wish they would have built bigger stalls. They don’t have to be penthouse-sized stalls but even a dozen extra square feet would make it much easier to work with the horses. While the extra space calls for more cleaning, it relieves the headache of horse maintenance in tight spaces. Concrete, dirt, and gravel have all been used for horse stall flooring. What’s tough about these materials is that they can be difficult to keep clean. While concrete and gravel allow for quick cleaning, you will have a hard time replacing these materials if they are ever damaged or fail. Adding mats to your horse stalls, whether on dirt, gravel, or concrete allows you to protect the materials below as well as maintain an easy-to-clean stall flooring. You have a few options when it comes to horse stall designs: interior columns or clear span. Once you choose which one of these you like, you can then build the rest of your stalls accordingly. 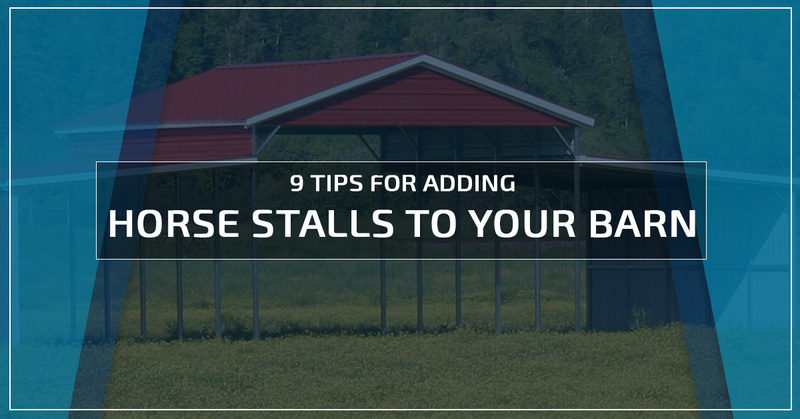 Each type has its pros and cons when it comes to horse stalls. The interior columns support the roof directly, which means their placement is determinant on where the roof needs it. The clear span horse stalls do not need to support the roof, which gives you more freedom on where you can place your stalls. For most, a horse wash stall is a luxury item, but it can be super beneficial. A dedicated space to wash, clean, and dry your horses makes it so that your stalls remain easy to clean. Also, the weather can make for washing a horse outside a chore. An interior horse wash stall saves time, allows you to groom and care for your horses, and keep your barn clean. If your dream barn doesn’t have a tack room, it’s time you consider one. If you’ve ever had a horse barn in Georgia, you know how valuable a tack room can be. You want easy access to your blankest, saddles, bridles, and other needed equipment. Also, a tack room protects your equipment from being exposed to too much dust. Vent your horse barn and stalls. Your horses need clean, fresh air to remain healthy. Barn ventilation helps keep the air quality high and your four-legged friends happy. If you’re concerned with winter temperatures, a well-fed horse produces enough of its own heat to remain comfortable, even if cold air is filtering through the barn. Finally, you can add ventilation fans to better circulate air. It’s common to store hay in the barn where the horses will be staying. This is ideal; however, the potential for hay to catch fire and cause major damage is a real concern. If you want to reduce the potential of a hay fire starting, store the hay in a building or lean-to nearby. As a leader in carports, lean-tos, and barns, Wholesale Direct Carports has been serving customers for 20-plus years. 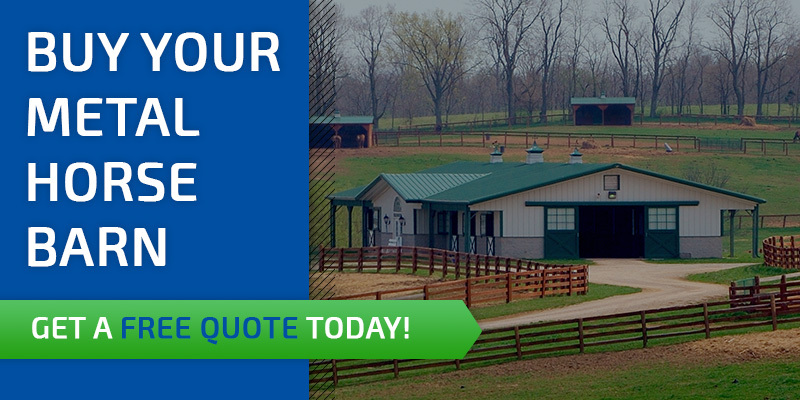 If you’re interested in building a horse barn, let us know! We can help you discover what you need, when you need it, and how to get it. Our prices are competitive, and we work to satisfy your needs. Contact us today for a free quote!